FIPCO: Fully integrated pharmaceutical company. These are companies that are active at all points of the value chain i.e. research, development, manufacturing and marketing/sales. A bright example of such companies is big pharma. Partial integration: this includes companies that exist only at certain points of the value chain. For instance, early or mid-stage biotech companies are research driven and either outsource development and manufacturing processes or out-license their product. Contract Research Organisations (CROs) and Contract Manufacturing Organisations (CMOs) are also examples of such business model. VIPCO: virtually integrated pharmaceutical companies. Such companies outsource almost all of the steps within the value chain. One of the most common examples of a “virtual” company is Shire Pharmaceuticals. Collaborative models: partnering with other companies for drug discovery. Such model is a common example of value and risk sharing. A similar principle applies in a co-development model. Biosimilar/generic: in such model the firm takes advantage of the patent expiry of branded drugs. It has to be noted however, that biosimilars differ from generics in the way that, biosimilars are required to prove their efficacy and safety. This primarily because, drug development and manufacturing of biologis is highly complex and therefore, biosimilar cannot be simple copies of biologics. Technology brokering: using a strong network of clients for bringing together two or more companies for reaching a deal. These companies can be referred as service companies. Follow-on (me-too) drug: developing a molecule that is already on the market but with new indication (Sabatier et al, 2010). Novo Nordisk’s business model will be discussed in order to demonstrate how one can identify and analyse the business model of a company (Figure 1 shows the main financials of Novo Nordisk). Novo Nordisk is one of the industry leaders within the field of insulin delivery devices market. More specifically, Medtronic has 20% share of that market while Novo Nordisk and Sanofi have 16% and 15% of the sector’s market share, respectively (Global Information Inc, 2012). Thus, in order for the three key players to at least maintain their market share, they should have a growth rate equal or greater than that of the market overall. One of the key characteristics of Novo Nordisk is its specialised R&D portfolio; both in the medical devices industry and the drug market the focus is on diabetes and insulin-related diseases. This characteristic can be perceived both as an advantage and a disadvantage. On the one hand, such specialisation may build a competitive advantage for the company as well as a brand over diversified organisations with multi-segment products and services. On the other hand specialised R&D, could be highly risky as it can make the company increasingly dependent on a specific market segment. For instance, if another entity discovers a product that can disrupt the diabetes market as a whole, then Novo Nordisk (or other “specialised” companies in that case) will be negatively affected. One way to compensate for such threat is forming strategic alliances and partnerships in which there is risk and value sharing. This is the point where the importance of business model becomes extremely significant. It can be seen from Figure 1 that there is a significant trend between the percentage of sales coming from in-licensing with EBITDA margin, especially from 2009 to 2012. For this purpose, I have identified the majority of partnership agreements (including in-licensing deals) formed by Novo Nordisk (Figure 2). 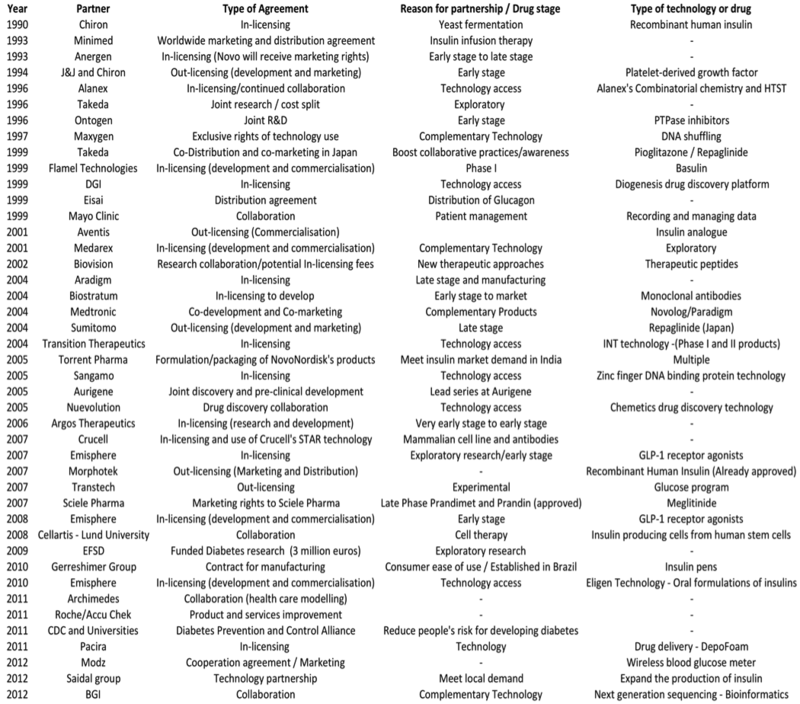 The first column indicates the year at which the agreement took place; the second column describes the type of agreement; in the third column I have determined the reason the partnership/alliance was formed or the stage at which the drug was in or out-licensed (where applicable); the fourth column describes the type of technology or drug that the agreement is related to. • In-licensed technology or granted access to different technologies that assisted Novo Nordisk in drug discovery and development. • Build brand name by marketing and distributing in-licensed products. • Avoided collaboration at pre-clinical stages with other companies. • Establishing in emerging markets, mainly India and Brazil by building/acquiring insulin manufacturing plants or through product co-development under local brands. • At the research stage Novo Nordisk seems to in-license promisingtechnologies instead of products (regenerative med., DNA binding technology, NGS) or make collaborations with the academia instead of with other companies. In conclusion, the analysis above suggests that Novo Nordisk does not use a single business model. Having this in mind, one can assume that the business model of Novo Nordisk is a combination of a collaborative and a partial integration model. However, it is not possible to assume a business model that would perfectly reflect the reality. As a result of the technological progress in the healthcare sector and challenges that Life Science companies are currently facing, many companies have decided to develop a flexible and adaptive business model that may change depending on various internal and external factors. It would be interesting to see whether and how would pharma (especially big pharma) change its business model to overcome its challenges.